A pochi passi dall'Opéra Bastille di Parigi si trova il mercato Aligre, un paradiso per i buongustai gourmet. 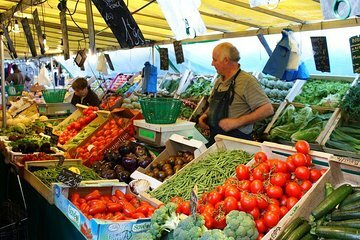 Esplora le belle e diverse offerte di questo mercato del 12 ° arrondissement con una guida in-the-know durante questo tour mattutino di 2 ore. Assaggia i deliziosi formaggi e il vino, il cioccolato e i salumi; chattare con i negozianti; e impara alcuni dei segreti ben tenuti della cucina francese. Quindi vai dove vanno i locali e goditi questa esperienza immersiva limitata a solo 10 persone. We were only able to take about an hours worth of the tour. I was disappointed we had to leave early as the tour guide was informational and engaging. If I were to return to Paris, I would definitely take this tour again. This tour was really enjoyable. The guide was great i think his name was stefan. We got to see around the market, we tried different local foods in various shops including a beer shop. The guide was very knowledgeable and entertaining, he said he was a chef by trade which i could believe. We finished up in a little wine shop with a bunch of locals and got to drink some quite nice wines. Unfortunately we had to leave as we were booked for another tour in the afternoon otherwise we would have happily stayed longer and kept drinking and chatting. We did multiple tours in 3 different countries during our holidays and this was the only one i felt compelled to tip the guide. He was that good and well deserved it. I can highly recommend this tour. This was amazing! Our tour guide, Stefan, was incredible...so passionate about food and so knowledgeable. We sampled delicious bread, cheese, meats, pastries and wine! It was one of the highlights of 5 days in Paris. There are not enough words to express my appreciation and relief to have Stephan as our tour guide. I've always stayed away from group tours because I feared being taken to mundane touristy spots or having a cheesy guide. But stephan couldn't be anymore perfect! He went above and beyond.